Study and bolted right on. Although it didn’t have the shielding tape for the exhaust heat; I was able to put a couple of strips of aluminum HVAC tape where it was supposed to go. The Tusk Street legal kit (rear fender and tail light) fit nicely. Fit well with the Tusk Street Legal kit. Perfect match and fit.. took it out of the box and was on the bike in 2 minutes..
Looks great, fits like a glove, and secures to bike with ease. makes my bike look new! makes my bike look new! went on easy and looks awesome! I bought the whole set, so I can't speak for how the color matches any of the stock pieces. Looks great and was a perfect fit. Install was super easy. Just what we neede and fast shipping! RMATVMC never fails! Good fit and finish. I can replace my rear fender with the color I always wanted. Easy way to make your dirt bike look factory new! Perfect fit, same as stock but cheaper. Good value when you go through plastic a lot. Acerbis makes great items at fair prices. What more could you ask for!! Fits fine. Came out of the package looking a little funky. Not scratched but the color was not consistent. Part looks shiny and part looks dull. Easy install, looks matches the stock plastic that is on the rest of the bike. This is a great replacement fender. Color matches perfectly and filament is precise. Would recommend this to anybody who is looking to replace or update the look of an older bike. Stoked on how this fender fit and looked on my bike. I have a 99 wr400 and its hard to find parts but this one fit perfect. Fits good, used it on a te 300 not a tax so rear mudflap/light doesn’t fit. Needed replacement fender for bike, Rocky Mountain ATV is my "go too" for fast shipping, fender looks good, good color match. Exactly what we needed for my son's bike. Se t in a very timely manner. Great quality. Perfect fit, molding & color match. Looks identical to OEM. Nice and glossy finish unlike cheap replacement plastic. Costs less than OEM and even better price with Rocky Mountain. It would be easier to stop breaking them but what fun would that be? As good as oem, looks nice, fits well, will buy again when the time comes. Acerbis plastic products are top notch. This one is no exception. The color holds up well and the fitment is spot on. Fits like OEM. Acerbis makes great aftermarket plastics. I found that no company makes them quite as durable as oem but they are close. Fits as good as OEM. Acerbis makes great aftermarket plastics. Fit and function where you need it. Looks good. Holds up decent. Hard to get some boot marks off but that another problem. You get one heck of a chuck of plastic for twenty bucks. 2015 yz450f perfect fit ! Minor cutting to fit an sm subframe,color matches perfectly. Easy install and looks awesome. This fender fit my bike perfectly! fits perfect and color matches ,new plastics are always nice and have that new plastic smell. Polisport rear fender looking good ,thank you RMATV. 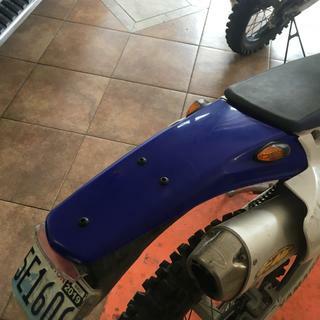 Bought the fender for my YZ125 and the color is a lot darker than my other plastics. The metal pieces from my old fender would not fit without some trimming on the plastic, which was tedious. Other than that, its not too bad. I want to change my 2011 Kx250f rear fender to the newer style. Will this fit without modification, like will bolts fit the same way? BEST ANSWER: I put one of these on the back of my 2012 KTM 350 EXC-F. It installed just like the OEM fender. I think it's made in the same factory? Everything fit perfect for me. the 2001 kx250f does use the current style rear fender so you are all set!! Does this come with the pre drilled holes and tabs to mount the tail light on a 07 wr450f? I dont want to have to drill all the way through the fender like did to mount my tail light to a yz fender. BEST ANSWER: It does not come with pre drilled holes. It comes with the 3 tabs same as the stock OEM fender from Yamaha, so yes you can mount your tail light. And yes you had to drill holes on your YZ fender because that does not come with a tail light. Do I need to get green or florescent green to match the oem plastics on my 2018 Kawasaki kx450f? BEST ANSWER: Green, Flo-green is just a special color we make. Has anyone purchased the light blue for the new 2019 white Yamahas? How well does the color match? I have a 2017 Husky TE 300, will the TX 300 rear fender fit? BEST ANSWER: It looks like they are listed differently for the two machines. What is the make, year and model of your bike? Yes, this is the same as the stock. Yes, it is an identical match. Will this fit 2015 crf450r? 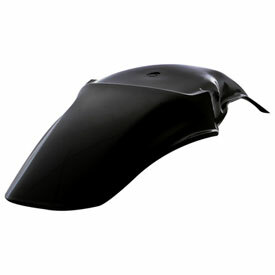 BEST ANSWER: The "Acerbis Rear Fender Black" part number 1002180159 is listed to fit the Honda 2015 CRF 450R. BEST ANSWER: No, it is the plastic fender only. Does anyone know if this will fit a 2015 WR250F? BEST ANSWER: The one I used on my 93 kawasaki kx 250 had to be trimmed a bit for best fit however the color matched perfect. So if it says it will fit you might have to trim it a bit. Razor knife works great. It was purchased for a 2003 KTM 300 EXC and was a direct bolt on. Will this fit a tail light? Must order correct fender for it to have mounting points. 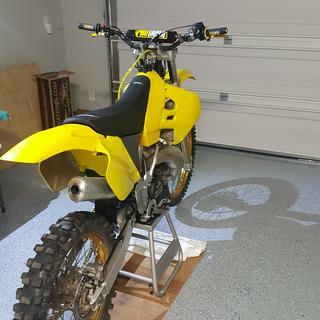 Does the Acerbis black rear fender have the mounting tabs for the tail light like the yellow one shows on a 2001 DRZ400? BEST ANSWER: We only make 1 mold for the DRZ400, so the colored fenders are identical and both have the tabs. Will this fender fit a 2001 KDX200?? Which orange is the match for 2018 250 EXC? BEST ANSWER: We only have 1 orange that matches that bike, its called ktm orange. Doesn’t it have the screw point fir a tail light, like the oem fx? Does it have mounting tabs for tail light for 2016 Husqvarna TE300? BEST ANSWER: No unfortunately this does not have the tabs for your tail lights. Does it fit 05 ttr125l? Does this fit a 2017 klx 110? BEST ANSWER: Sorry we do not have any plastics for a 2017 KLX110. Will this fit a 2000, 2001 TTR 225? BEST ANSWER: Acerbis does not make any plastics for the TTR 225. BEST ANSWER: Can you let me know which bike; make, model and year you are talking about? All I see is a black fender on this message sorry. Does this fender have the screw holes underneath it to mount the sub-fender on it ? The sub-fender is labeled as "number plate carrier". The DRZ yellow has changed throughout the years. My 2003 has an older darker yellow, the yellow in the photo looks like the newer bright yellow. I don't want mismatched yellows. Will this fender match the older style yellow of my DRZ? BEST ANSWER: You can't go by pictures when you look at a photo online. Colors can't exactly match because the pics could be for print or for web. The color we have is called 01 Rm yellow. So it matches 2001 to current. Will this fit a 1991 cr 250r? Will this fit a 03 yz 125? Will this fit my 2003 crf450? do i need the sub fender to mount this seeing as how my kid broke both? 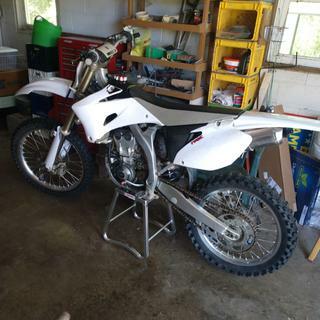 Will this fit my 2013 YZ 125?